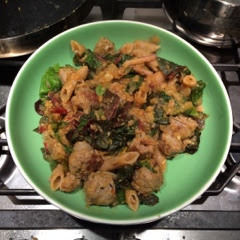 I loved this pasta dish, I think squash makes the most awesome pasta sauce and I used some lovely Italian sausages. I'm definitely going to try making some different variations on this. Bring a pan of water to the boil and add the squash, cook for 15-20 mins, then drain and puree. Bring a pan of water to the boil and cook the pasta according to packet instructions. Meanwhile, heat a little oil in a frying pan and brown the sausage with the onion and garlic. Once brown add the chicken broth and bring to a boil. Lower the heat to medium and add the pumpkin, yogurt, sage, nutmeg, salt and pepper. Stir to combine everything. Keep over a medium heat until the sauce begins to boil again then lower to a simmer. Drain the pasta and add to the frying pan with the squash and sausage. Stir to coat. Add the chard and stir in until it wilts. Serve.